1. Heat the milk so that it is lukewarm (around 43 C/110 F). Measure 1 teaspoon from the 3/4 cup of sugar and stir this into the milk along with the yeast. Leave it to bubble and froth (about 10 minutes). 2. Meanwhile, sift flour, the rest of the sugar and salt into a large bowl and whisk to combine. Add lemon zest, egg yolks and melted butter, mixing well. Once the yeast is ready (it should be bubbly and frothy), add to the bowl along with the dried fruit and mix to combine. 3. Using your hands, fold the dough, so that it is well combined. The dough will be slightly sticky – this is perfect. If it is too sticky to handle, add a little more flour. 5. Once the dough has risen, take the dough out of the bowl and cut into two parts – 1 part 60% the other part 40%. Gently roll each part into a log shape. 6. Cut the big log (60%) into five equal pieces and the smaller log (40%) into 4 pieces so that you have nine pieces in total. 7. Using your hands, roll each piece into a strand, about 1 inch thick. Group the strands into 3 groups: 2 slightly longer strands, 3 slightly shorter strands, and 4 slightly shorter strands. (The 4 strands will be braided together to make the bottom braid, the 3 strands will make the middle braid and the 2 longer strands will be twisted together to make the top braid. We want these two to be longer as they will be tucked underneath the overall braid when finished). 8. Following the links in the post as a guide, braid the four shortest strands (all equal length) together using the videos mentioned in the post as a guide. Once braided, make a dent in the middle of the braid with the side of your hand so that it is flattened slightly making it easy for the next braid to sit on. 9. Mix the egg yolks in a small cup and using a pastry brush, brush over a light coating of egg mixture over the braid. 11. Next, braid the group of three strands together in a plait. Make a dent with the side of your hand like you did with the first braid and brush with the egg wash. Place this braid on top of the previous braid. 12. You’re nearly there! Braid the last two strand together by twisting them over each other. Place on top of the other braids, tucking the ends underneath the overall braid to hold it together. You should have a stack of three braids. The braids now need to rest for 1 hour, so cover the braids with a tea towel and put in a warm place. 13. Once the dough has rested, heat the oven to 175C/350F. Brush the entire braid with egg wash and sprinkle the almonds on top. To prevent the bread from toppling over when baking, insert 4 skewers in the creases of the braids. Completely cover the braid with tinfoil and bake for 45 minutes, covered the whole time. After 45 minutes, take the foil off and bake for a further 5 – 10 minutes or until the skewers come out clean. 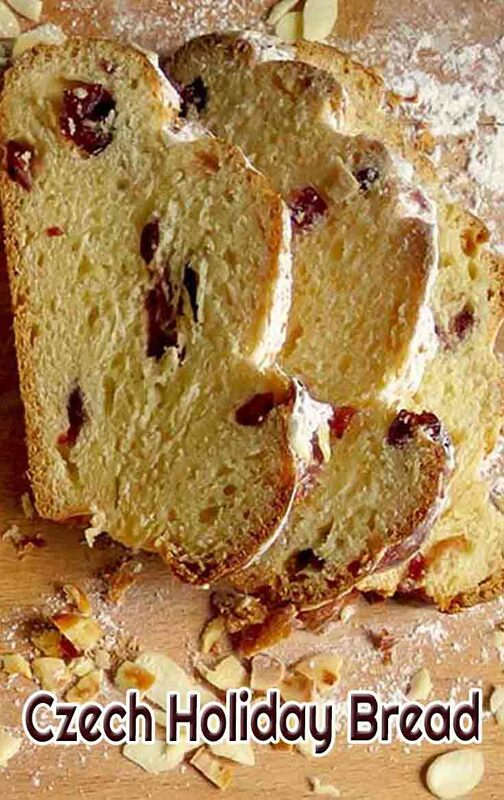 This bread is best eaten the day or day after it is made. If making for Christmas day, prepare it the night before, ready for breakfast in the morning! My preference is to eat it with a generous helping of butter.